View of the entrance front of Herstmonceux castle in Sussex. A relatively late castle, the license to crenellate was granted to the owner Sir Roger Fiennes in 1441. This is typical of its time- a quadrangular castle surrounded by a wide moat. It has boldly projecting octagonal towers on each corner and small tower along each site. However the highlight of the castle is undoubtedly its gatehouse. It has two huge flanking towers which are crowned with machiolated battlements, from which further cylindrical turrets sprout. It measures 85ft in height. 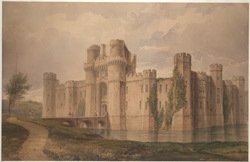 It is often argued that 15th century English castles were built for show and not primarily for defence. However Herstmonceux was intended to defence Sussex against the French. It has gun ports, arrow slits, numerous towers and real machicolations.